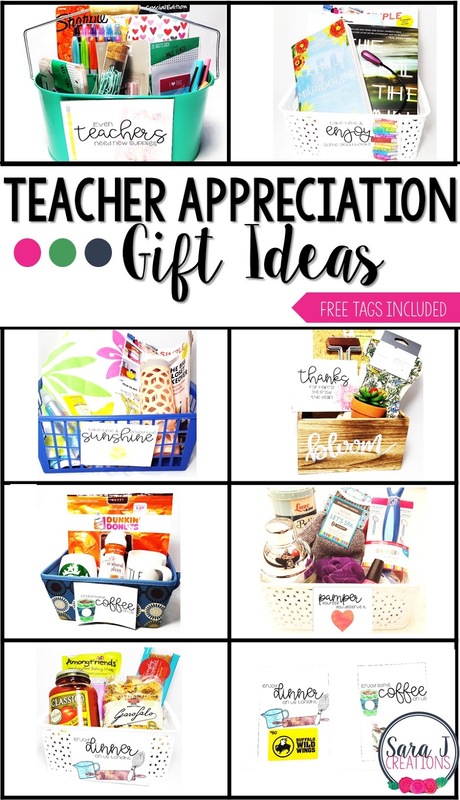 Teacher appreciation week is coming soon and I've got some gift ideas for the teachers in your life. As a teacher I was always sort of embarrassed to be put in the spotlight for that week, but it was so nice to know that our parents, students, PTO and school community appreciated us. Teaching is a hard job and it is always nice to get recognition for what you do every day. When I was in the classroom I got everything from handmade cards and gifts (so so sweet), to flowers, to snacks throughout the day, to mini massages at lunch, to lunch provided by PTO, to gift certificates, to group gifts and more. I came up with some gift basket ideas that would make fun teacher gifts but the same cards could also be paired with a gift card. I know some people don't like giving gift cards or think they aren't personal, but I always loved getting gift cards as gifts when I taught. It was nice to be able to spend those cards on myself or my family with no guilt or worry about the budget. Would any of the teachers in your life love these gifts? Make sure you download the free tags at the bottom if you want to create your own gift baskets. This post may contain affiliate links for your shopping convenience.View our full disclosure policy HERE. Where possible I linked to sample ideas for you that were similar to what was in the pictures. You can also find items at stores near you. Teachers LOVE Target and they always have great goodies. I linked to Amazon as much as possible for you. Most teachers I know love school supplies. And most that I know have a reserved stash of "teacher supplies" that is just for them to use and off limits to their students. What better way to shower them with your love and appreciation than give them some of their favorite teacher pens or teacher markers. Not sure what they love? Ask them, have them fill out a survey or I'll let you in a on a few teacher favorites. Now remember, these aren't supplies for the class to use (like when glue sticks run out), but supplies just for the teacher. Who doesn't love having a night off from cooking? I think we all could appreciate a night where we didn't have to cook. Make your favorite teacher's day by giving him/her a basket of supplies that could be used to make a simple meal. Or take it a step further and prepare a meal and take it to school (hot or frozen) for your teacher and her family. Another easy way to do this is to get a gift certificate to a favorite restaurant. Curling up on the couch with a cozy blanket and a good book. Sounds like heaven! I'm sure most teachers would love this but don't always have the time to do it. A great way to start a vacation is loading them up with some new books and magazines. If your favorite teacher is into gardening, why not surprise them with goodies for the garden? Every gardener could use a new pair of gloves or some new seeds or plants. Put it all together in a cute planter box (from Target) and you are ready to go. Coffee, coffee, coffee! I know not everyone runs on coffee, but I know a lot of teachers do. This basket is a great way for them to have a morning pick me up on you. Fill it with goodies to make coffee at home or at school or load them up with gift cards to stop and get coffee on the way to school. -Gift certificates for Starbucks, Dunkin Donuts, Tim Hortons, etc. Let your favorite teacher enjoy some relaxation and pampering with a spa basket. Give them a gift certificate to a local spa for a manicure or mini massage. Or put together a basket so they can relax and unwind at home. Everyone is ready for vacation, a break, a little time in the sun, am I right? Get your favorite teacher ready for vacation with an outdoor/sunshine themed basket. All of the cute cards you see in the above pictures are FREE for you, my fabulous readers to download. For each card, I also made a larger size with a blank space ideal for a gift card. Just print out on cardstock or heavy paper and tape on a related gift certificate if you don't want to make up a basket. Easy peasy way to show your favorite teachers lots of love. Both sizes of cards leave lots of white space so you can write a personalized message as well. Click below to download. After you enter your information, the Teacher Appreciation Cards will be automatically emailed to you.